Toothpaste For Acne - Is It Safe And Effective For Your Skin or Not? Toothpaste For Acne – Is It Safe And Effective For Your Skin or Not? There are some home remedies everyone seems to just know: chicken soup for a cold, ginger ale for a stomach ache, and toothpaste for acne treatment. But do these do-it-yourself solutions have any truth to them, or are they urban legends, passed from one generation to the next? We can’t speak for chicken soup or ginger ale, but we do know a few things about toothpaste. Generally speaking, it is a myth that toothpaste can help get rid of acne. I know, we were disappointed too. Many of us here grew up dabbing a bit of toothpaste on especially stubborn pimples before bed each night, and we were sad to discover that we may have actually been making our acne worse. Even though it’s a popular home remedy, you really shouldn’t use toothpaste for acne. There are a lot of things about toothpaste that make it pretty bad for your skin—so many, in fact, that we started to wonder how this home “remedy” even came about. But don’t worry, we found several other options that can actually help treat your skin. This article will explain the dangers of baking soda, alcohol, and other common toothpaste ingredients, explore whether you should be trying to dry out your pimples or moisturize them, look at DIY acne solutions that really work, and answer some frequently asked questions about toothpaste and acne. A quick glance at the list of ingredients on any tube of toothpaste should be enough to convince you that it’s a bad choice for acne treatment, if you know a few key details about acne, skincare, and chemicals. First, chemicals are not inherently bad, especially those designed specifically for taking care of your skin. They sound harsh (maybe they make you think of bleach or alcohol or mishaps in a high school chemistry lab) but in reality, everything has a chemical makeup, and they’re nothing to be afraid of. When it comes to acne treatment and skincare, there are plenty of chemicals that are gentle enough to take care of your skin without hurting it. How do you know which ones are safe? You could memorize a list of FDA-approved substances, but those change all the time. It’s better if you have a solid understanding of how your skin works, what causes acne, and what kind of chemicals combat those causes. Acne is caused by everything from stress to genetics, but when you get down to the skin level, there are three main causes: inflammation, bacteria, and oil production. All three of these issues come together in various ways to create different forms of acne, which include blackheads, whiteheads, papules, pustules, and cysts. We’ve lumped these two together because they are very similar. Blackheads are usually caused by too much sebum (the oil your skin naturally produces) and dead skin cells getting clogged in an open pore. Whiteheads are caused by the same issues, but the sebum and dead skin cells are trapped in a closed pore. You may have heard that blackheads are caused by dirt, but that’s another common acne myth; blackheads get their dark color from being exposed to the air, sort of like how an apple turns brown after you peel it. Papules are raised bumps without a clear head, sort of like pre-pimples, and they’re caused primarily by a combination of inflammation and bacteria, although sebum can also be involved. Skin is very sensitive, and it can become inflamed at any sign of stress, physical or emotional. If you’re really worried about a big exam coming up or an important presentation at work, your body could release fight, flight, or freeze hormones that trigger the inflammation response. This causes your skin to swell slightly, closing pores and trapping bacteria and sebum inside. Pustules are better known as pimples, and they form when the immune system tries to fight off the bacteria that got trapped under the skin when the pimple was still just a papule. To fight the bacteria, your immune system triggers the inflammation response, so the skin becomes even more inflamed in that area, which is why pimples are often red and painful. Pimples get their white or yellow heads when the immune system has successfully fought off the bacteria, generating pus in the process. Cysts are large, raised bumps without a clearly defined head, and they are generally considered to be a more severe kind of acne, although they are not uncommon. Cysts form when acne-causing bacteria pull a fast one over your immune system. Cysts start out as papules, then pustules, but then when your immune system tries to fight the infection, the bacteria release a chemical that attaches to your skin. This chemical makes it seem like your skin is the bacteria, so your immune system fights your own body, leaving the infection to grow. This makes the pimple bigger and allows the bacteria to burrow deeper into your skin until it forms a cyst. If you’re wondering which kind of acne toothpaste helps with, the answer, sadly, is none. 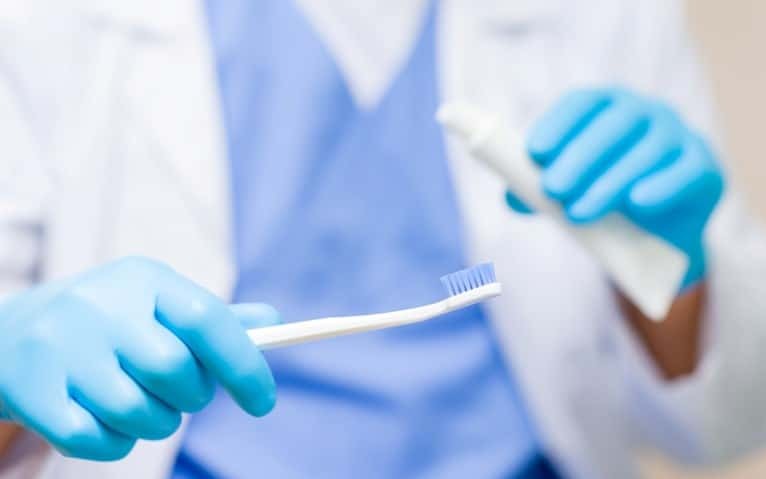 If you’ve read some other articles promoting the wonders of toothpaste, they might say that because toothpaste fights bacteria on your teeth, scrubs plaque off your teeth, and prevents acidity, it can do the same for your skin. The problem is, your skin is nothing like your teeth. Let’s start with how toothpaste fights bacteria. All bacteria are not created equal. Just because something fights a certain kind of bacteria doesn’t mean it can fight them all. Your skin and your teeth deal with very different kinds of bacteria, and toothpaste has not been proven to fight acne-causing bacteria¹. The bacteria primarily associated with acne are p. acnes, and dental plaque is largely made up of s. mutans. Because both of these bacteria are anaerobic, meaning they flourish best when not exposed to the air, some sources claim that baking soda can kill both. In reality, baking soda kills neither. It is bacteriostatic, meaning it merely prevents bacteria from reproducing, and it has not been proven to do even that with p. acnes. Baking soda is the ingredient primarily responsible for toothpaste’s ability to scrub the plaque off your teeth, preventing buildup and eventual cavities. The way baking soda removes plaque is similar to how other ingredients exfoliate the skin to remove excess sebum and dead skin cells, but it’s also incredibly different, because it’s much too harsh. Baking soda is supposed to be the big secret behind using toothpaste for acne, but it’s actually not very good for your skin. It is a harsh exfoliant that will almost definitely irritate your skin and cause inflammation. As we discussed, inflammation causes sebum and bacteria to get trapped under the skin, leading to papules, pimples, and cysts, so you want to avoid harsh products or rough scrubbing. This is difficult because we often don’t like our acne very much, and it can be tempting to try and scrub it all away. We’ve all been there, but it’s important to treat your skin gently, and remember that acne is a nearly universal experience, and you aren’t alone. Finally, some sources say you should use toothpaste for acne because it prevents acidity from breaking down your teeth, so it should protect your skin from acidity too. The biggest issue with this is that your skin is acidic², and it’s supposed to be. The pH scale³ measures how acidic and non-acidic (basic/alkaline) something is, with 1 being incredibly acidic (think battery acid) and 14 being incredibly alkaline (like lye). Regular water is considered neutral at a 7. Skin almost always falls between 4.5 and 5.5 on the pH scale, making it mildly acidic. Baking soda, the ingredient in toothpaste that makes it alkaline, is a 9. This is obviously a huge difference, and applying such an alkaline substance to your acidic skin can cause all sorts of issues. It definitely won’t help with acne. So baking soda, the hero in the myth of using toothpaste for acne, does not actually treat acne at all, and may actually make things worse. Are there other ingredients in toothpaste that might be able to help? We all love that foamy, tingly toothpaste feeling, but for those of us with acne, it may be part of the problem. Many toothpastes contain something called sodium lauryl sulfate (SLS), the substance responsible for the pleasant foaming experience. When combined with water (or saliva) it forms bubbles that help lift bacteria and plaque from your teeth, which are then washed away when you rinse. When many people use toothpaste for acne, they don’t combine it with water, they simply apply a small amount directly to the affected area, so SLS is not necessarily an issue (although it also isn’t helping). But if you’ve noticed acne around your mouth, SLS could be to blame. As you brush and rinse, some of the foamed up toothpaste is more than likely to end up in the corners of your mouth or on your lips, and it can cause acne. SLS, and other foaming agents, can irritate the skin and clog pores, so if you are acne-prone, it’s usually best to avoid them. They can be found in toothpastes, shaving creams, shampoos, and other daily care products. A quick Google search for sodium lauryl sulfate free products should provide some alternative options, but SLS is just one more reason toothpaste is not a great acne treatment. Should You “Dry Out” Your Acne? Have you ever heard that toothpaste “dries out” your acne? That’s what most people say when explaining why you should try toothpaste for acne. On a common sense level, that sounds right, especially if you have oily skin. Excess sebum clearly contributes to acne, so if you can dry out the oil, you might be able to prevent acne. And pimples are full of pus and other liquids, so if you can dry them out, you can treat the pimples you already have. It’s a great theory, and there is some truth to it, but it’s not that simple. Excess sebum can clog pores and definitely leads to more acne. The problem is how most acne products go about drying the skin. Many of them contain alcohol, or alcohol-based chemicals, which dry up the oil, but they also irritate the skin. This can trigger the inflammation response, closing pores and creating acne, but it can also activate the sebaceous glands, which produce sebum. It may seem backwards, but drying agents, if they are too harsh like many alcohol-based products, can actually increase the amount of oil on your skin. This is the case with toothpaste. Most toothpastes contain glycerol and sorbitol, which are both alcohol-based chemicals, and they can dry out acne in a bad way. They are too strong, and although they might get rid of a particularly troublesome pimple in a hurry, a new one will almost definitely pop up in its place. It’s best not to use toothpaste for acne because there are many differences between your teeth and your skin. There are two ways to avoid this cycle: first, avoid using toothpaste for acne and find a drying product that is gentle with your skin, like sulfur, and second, find a good water-based moisturizer. If you have oily skin, you may think we’re crazy to recommend a moisturizer, but keeping your skin properly hydrated can prevent inflammation and the acne that often results. Even though toothpaste for acne isn’t the best home remedy, there are others out there that really can help. Our favorites are honey, aloe vera, and green tea. Honey is one of mankind’s oldest remedies and it is still used today, and not just as a home remedy. Doctors use honey-infused dressings when treating wounds because studies show that honey can speed the healing process. This is great news for acne, since it is technically a kind of wound. Honey fights bacteria (including p. acnes)4 and reduces inflammation, making it a great preventative tool and a good spot treatment for acne you already have. It can be used on its own or in fun DIY recipes, but make sure it’s pure honey. This is relatively easy to check for, just look at the list of ingredients. It should only say “honey.” If fructose or maltose or any other ingredients are added to the list, it will almost definitely not treat acne as well. Aloe vera is another great home remedy, especially if you have fewer blackheads and more pimples. If you’ve ever had a bad sunburn, you know how soothing aloe vera can be, and it can be just as soothing for acne-prone skin. Acne often starts because of minor inflammation, so if you could keep your skin from becoming inflamed, you could prevent a great deal of acne. Aloe vera is a natural anti-inflammatory agent5, so it can prevent the initial inflammation that causes acne, but it can also reduce inflammation surrounding acne you currently have. Many pimples are red, raised, and painful, and aloe vera is great for making them less noticeable and less painful. One last home remedy we like to recommend is green tea. The research on this one isn’t as airtight, but it’s still a much better option than using toothpaste for acne. Like honey and aloe vera, green tea is also anti-inflammatory6. Drinking it could reduce your overall inflammation, but if you have a pimple you want to treat specifically, you can brew a cup of green tea, let it cool, and pour it into an ice cube tray. If you apply the ice cube directly to the affected area, it should bring down any swelling and reduce redness. Q. I’ve used toothpaste for acne before, and it worked! Are you sure toothpaste is really that bad? A. If toothpaste has worked for you in the past, that’s great! We aren’t saying that it’s the worst product in the world and that if it ever touches your skin, the acne gods will curse you, and your children, and your children’s children. We’re just saying that out of all the great home remedies and over-the-counter acne treatment options, toothpaste is probably not the best. In the past, it may have helped get rid of a pimple, but did your skin get red or irritated, or did more acne appear in a few days? If so, did it really “work”? It may have gotten rid of the pimple quickly, but in the long run it hurt your skin. If you’re looking for long-term skincare that will keep your acne at bay for more than a few hours or days, you probably want to try a full acne treatment system, like Exposed Skincare. We recommend their products specifically because they avoid the crucial mistake many of us make when we try to use toothpaste for acne: it’s not too drying. Some of the other big name skincare companies (looking at you, Proactiv) use very high concentrations of drying ingredients, and they can definitely make acne worse. Exposed uses low concentrations of drying ingredients, like salicylic acid, and includes hydrating natural ingredients, like aloe vera. The combination seems to work for most skin types. Q. Are there any brands of toothpaste that could help with acne? A. Generally, it’s best to look for other treatment options. But if you really want to try toothpaste to treat your acne, there are a few brands with less harmful ingredients. Brandless has a peppermint toothpaste that doesn’t contain alcohol, fluoride, SLS, or baking soda, although it does contain calcium carbonate, a similar substance that could have similarly harsh effects. Its price is good for experimenting too; at only $3 for a 4 ounce tube, it won’t be the end of the world if this toothpaste doesn’t help with your acne. One other option is Tom’s of Main, and the price is similar ($4.69 for 4.7 ounces). Unlike Brandless, it does have glycerin and sorbitol, which could dry out your skin in a bad way and cause more oil production. Q. If toothpaste is so bad for your skin, why do we all think it helps? This is a little unclear, but when you’re unsure about why a product is being touted as a miracle cure for something it is objectively bad at treating, your best bet is to blame capitalism. Companies will do anything to sell their product, and industries will do anything to keep their products relevant. Even if that means fibbing a bit and saying their product that’s meant for teeth is also somehow magically effective for treating your skin too. Baking soda and acne. Acne.org. pH meters. Explain That Stuff. Qiong W. Antimicrobial effect of Manuka honey and Kanuka honey alone and in combination with the bioactives against the growth of Propionibacterium acnes. Massey University: Theses and Dissertations; 2011. Surjushe A., Vasani R., Saple D.G. Aloe vera: a short review. Indian Journal of Dermatology. 2008;53(4):163-166. Saric S., Notay M., Sivamani R. Green tea and other polyphenols: Effects on sebum production and acne vulgaris. Antioxidants Open Access Journal. 2017;6(1):2.